1. Take the Huron Boulevard exit. 2. At the first light, which is Fulton, turn left (west). 3. Take Fulton 4 blocks to Harvard Street and turn right (north). 1. Take the 1-94 East exit. 2. Follow directions (above) for 1-94. 1. Take the University Ave/4th Street exit. 2. At the second light, which is University, turn left (east). 3. Take University 12 blocks to Oak Street and turn right (south). 4. Take Oak Street 4 blocks to Delaware Street and turn right (west). 5. Take Delaware Street 2 blocks to Harvard Street – the church is at that corner. For parking, just after the stop sign at Walnut, turn right into the hospital parking ramp on Delaware (before Harvard) OR go straight to Harvard, turn right, and go halfway down the block to Grace’s Parking Garage. Grace has a new parking garage! Located across Harvard Street from Grace (and down the block just a bit), the big brown door is the entry to our new parking facility. On Sunday mornings, the garage door will open automatically when you approach in your vehicle; all other times a code is required to enter—please contact the church office for more information. The pedestrian access door to return to your vehicle is to the left of the garage door, which also requires a code (same code as the garage). 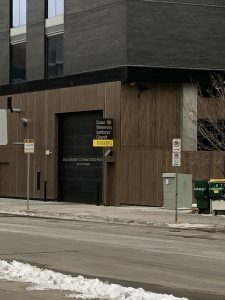 There is both an elevator and stairway to access the garage and street levels. While the whole parking garage is Grace’s to use, due to sub-contracting there are limited spaces available during weekday office hours. If you plan to attend a meeting at the church, please inquire ahead of time to see where it’s best to park. Alternative parking is available in the hospital ramp. Parking is available in the M Health Hospital Patient and Visitor Ramp (“G” is the ramp – Grace is not shown on the map, but is located between that ramp and Moos Tower to the west). When you are at Grace, pick up a parking voucher which will allow you to exit the ramp for free. Parking is also available nearby in the Washington Avenue or Oak Street parking ramps for an hourly fee (expect to pay about $6 for 2 hours). There are many parking meters on nearby streets, including the block of Delaware directly to the south of Grace’s building. Do you prefer public transportation? It’s convenient! We are one block from the Green Line – East Bank Station. Working on a map option…for now, click on the footer map below!